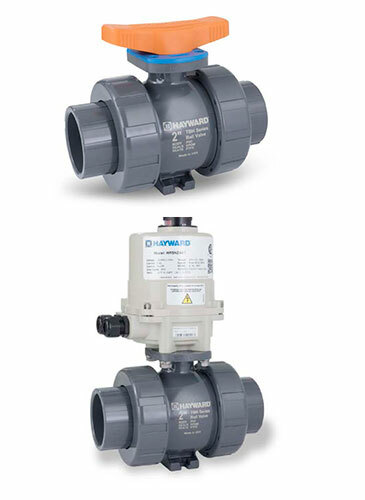 Hayward manufactures flow control products in thermoplastic materials including PVC, CPVC, PP, GFPP and PVDF. These materials are non-conductors and are immune to electrolytic and galvanic corrosion. Equally important, they contain nothing to leach out and contaminate sensitive fluids or delicate ecosystems. In addition, Hayward offers one of the industry’s largest range of pneumatic and electric actuators and accessories, allowing you the ability to control your systems with one partner. Starting with simple actuated ball valves up to 24″ butterfly valves with proportional control, Hayward continues to provide customers with an industry-leading choice of valve actuation packages to satisfy the most demanding application requirements. Hayward’s industry leading Basket and Y-Strainers are designed to protect pipeline system components from dirt and debris while allowing process media to flow freely. Simplex and duplex Basket Strainers are manufactured in PVC, CPVC, GFPP and clear Eastar, and are available with thermoplastic, stainless steel or specialty alloy baskets in a variety of perfs and meshs. Y-Strainers are offered in PVC, clear PVC or CPVC materials with FPM or EPDM o-ring seals and a range of perforated thermoplastic or metal screens. Unlike traditional metal and plastic filters, Hayward’s patent pending GFPP FLV Series Bag Filter features a one-piece injection molded thermoplastic glass filled polypropylene body with true union end connections, ergonomic cover design with liquid displacing dome, vent valve and drain plug. Available in simplex through quadplex assembly, the FLV Series can also accommodate a single 7″ cartridge or up to five 2-1/2″ cartridges.